Ragnarok M: Eternal Love [Global Server] War of Emperium Update! 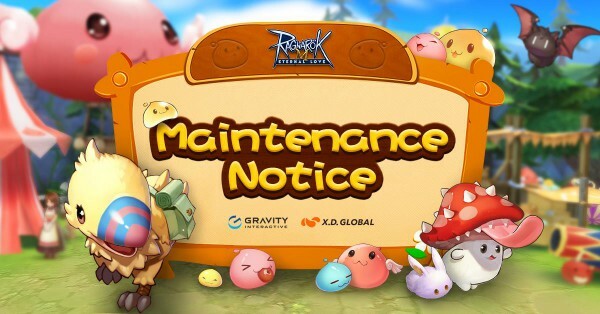 ‘Ragnarok M’ has scheduled maintenance on April 24 from 02:00 AM to 05:00 AM (US Mountain Daylight Time). As this update will address and fix game issues, players will not be able to log in during the maintenance. When the maintenance has completed, players will receive Adventurer Coins x2, Hot Meal x2, and Lightning Chain x2 as compensation for the maintenance. 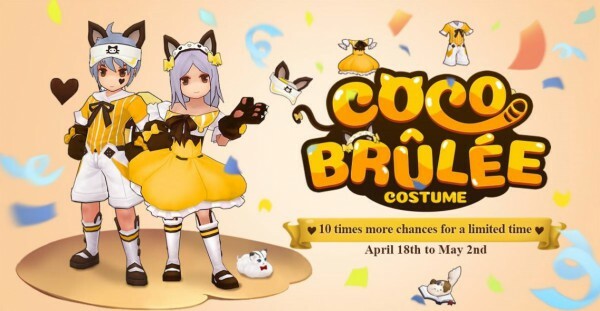 3) BCC Recharge Bonus Reset: After this server maintenance, each first purchase for each respective 30/128/328/648BCC pack will award double the amount of purchased BCC. We have scheduled server maintenance on April 24th, from 12:00PM to 6:00PM (GMT+7), to process a new update patch. During the maintenance, players will not be able to log into the game. After the maintenance, we will send 4x 「Adventurer Coins」, 4x 「Hot Meal」, and 4x 「Lightning Chain」 as compensation rewards. We apologize for this inconvenience. 1) A New Major city, [Castle in the Sky - Juno], is now available! Adventurers can head north of Al De Baran to get to the Republic of Schwartzvald’s Capital “Juno”. 2) Five new field maps: Border Checkpoint, Einbroch Field, and Magma Dungeon 1F-3F. 3) Brand New Boss Monsters: MVP – Arc Angeling, MVP – Firelord Kaho, and Mini – Fire Witch. So please be careful Adventurers, as you may run into them! 4) A new main storyline, “Juno”, is available! Adventurers who are at level 98 or above can accept this Quest from NPC “Mathay Siv” in Prontera North. * At level 98, 99, and 100, Adventurers can head into Juno, Einbroch Field, and Magma Dungeon 1F to explore. 8) The brand new equipment will be available. Adventurers can head into Juno to find the equipment craftsman NPC, or upgrade your current gear to obtain the new equipment. 7) At level 99, Adventurers can accept the new Minstrel’s Quest for Juno area. 8) Brand new equipment will be available. Adventurers can head into Juno to find the equipment craftsman NPC, or upgrade your current gear to obtain the new equipment. 1) A 3rd-job advanced mission is available for all the classes. Adventurers who have reached job level 70 can go to the adventure hall to accept the 3rd-job change Quest. 3) New builds for all the 3rd-jobs. 4) For Rune Knights, Royal Guards, Rangers, and Mechanics, there will be new mount items available in the game; (Atlan Green Petite, Dulange Green Petite, Rilada Green Petite, Red-Bristled Gryphon, and Brown Feather Gryphon for both Rune Knights and Royal Guards – at the price of 198 Big Cat Coins). 5) The item shop will have new consumable items available for 3rd-job classes; (New Poison, Thorn Seed, Wall Paint, Holy Water, Madogear Fuel, Shell, and Rough Rune Stone). 6) Some skills have been balanced based on 3rd-job skills. * “The Flash”, “Trump Tamer”, “Ferity Awakening”: “Falcon” has been changed to “Beast”; “Beast” includes “Falcon” and “Wolf”; but note that “Falcon” and “Wolf” cannot exist at the same time. 1) New mount for Rune Knights – Valg Green Petite, which can be purchased from Kadir in Prontera at the price of 30,000,000 Zeny. Rune Knights can ride the dragon after leaning the skill “Dragon Training”. 2) New mount for Royal Guards – Saint Gryphon/Night fire Gryphon, which can be purchased from Kadir in Prontera at the price of 30,000,000 Zeny. Royal Guards can ride the Gryphon after the purchase. 3) New pet mount for Rangers – Ruca, which can be purchased from Kadir in Prontera at the price of 198 Big Cat Coins. Rangers can ride it after learning the skill “Warg Rider”. 4) New pet mount for Rangers – Hatii, which can be purchased from Kadir in Prontera at the price of 30,000,000 Zeny. Rangers can ride it after learning the skill “Warg Rider”. 5) New equipment for Mechanics – Mecha helm, which can be purchased from Aiky in Prontera at the price of 3,000,000 Zeny; there are total of 16 colors for you to choose, they can only be used by Mechanics. 6) New equipment for Mechanics – Splendida Mecha and Splendida Helm, which can be purchased from Aiky in Prontera at the price of 30,000,000 Zeny and 5,000,000 Zeny, respectively; they can only be used by Mechanics. 1) At the Prontera NPC “Enos”, Adventurers who have advanced to the 3rd-job, will be able to change your outfit’s color with the Costume Dye feature. * “Tarot Card”: opening this will have a chance to give Oracle Dungeon exclusive cards. * Obtaining “Oracle Dungeon exclusive cards” will unlock the stats in Adventure Handbook, but cannot be placed on the shelf in Exchange. * “Oracle Dungeon” will give “Friendship Proof”. Adventurers who have finished the “Oracle Dungeon” challenge will receive “Friendship Proof” when helping others. 1) The first recharge double bonus will be reset for 30/120/298/598 Big Cat Coins purchases. Fix some items’ icon not showing properly. I’ve heard that Juno is a place where dreams can take flight! 3rd Class is now available for Adventurers who have reached their 2nd Class and JOB Lv.70! Now, let’s check all the 3rd Classes! Juno, here we come! The girl hesitated, but then slowly a smile started to appear. The sun shined on her, dancing around her as if she were a gentle flower. She was quiet and spoke gently. With her words masked in embarrassment, nobody heard what she said. But in this moment, Nino read her words.